6 min read . Updated: 31 Mar 2018, 03:33 AM IST Nidheesh M.K. 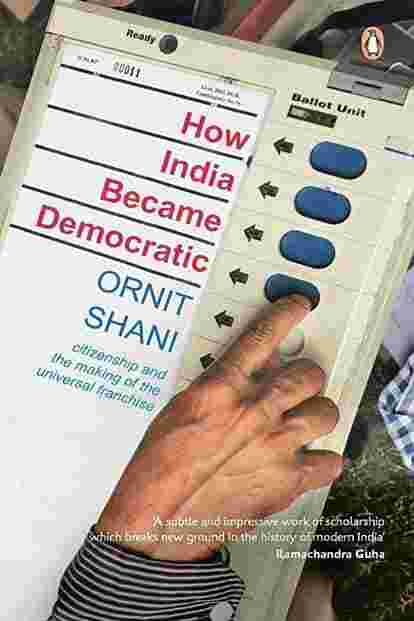 Ornit Shani’s How India Became Democratic: Citizenship And The Making Of The Universal Franchise is a one-of-its-kind study, focusing on the preparation of India’s first electoral roll in 1949. It was the largest such voter list in the history of democratic exercises in the world. Altogether, the thickness of the printed list could cover 220 yards, almost the size of 10 tennis courts, Shani quotes Rajendra Prasad, independent India’s first president, as saying. Prasad was also the president of the constituent assembly, which oversaw the process against a background of staggering odds. Logistically, it was a nightmare. Some 175 million people had to be enlisted, of whom 85% had never participated in any voting process, the book says. Nearly 50% of the population was living in poverty in the early 1950s, according to a 2004 World Bank report, and more than 85% were illiterate, according to the book. Yet Shani’s account will make you marvel at the electorate—especially the illiterate masses and the people at the margins, whom the colonial government held in poor faith. For instance, the book talks about how a tribal group from Abhor Hills, Arunachal Pradesh, appeared to testify before the authorities. They had to march five days through the forests to reach the spot. “What do you want?" the chairman of the sub-committee asked them. “Sir, we want to live where we are, but we must get proper education and we must all make advancement. We must have schools, we must have roads, we must have hospitals and all that," the Abhor people replied. Until then, in the official corridors, their habitation was just another “uncivilized place", where “all figures about that area are guess-work". There were other issues at play. The federal fault lines had to be dealt with delicately: The rulers of 552 princely states were yet to join the union, and any setback in the deliberations to draw up a voter’s list would mess up the process of nation-building. The “United States of Travancore", for instance, did not want to enlist the Tamilians who had migrated from Madras to the rolling hills of Munnar as plantation labourers—because they were not sons of the soil. An entire chapter dedicated to the registration of women voters illustrates how long-standing social divisions and conservative mindsets were at play as well. It shows the way the makers of the list had to allow some wiggle room for the patriarchal forces within society, the foot soldiers of which were often women themselves, to get women into the rolls. For instance, women in many pockets were unwilling to give their names, or objected to the entry of their actual names owing to “social or religious" concerns. Instead, many of them agreed to be listed only if they were given the option of enrolling as wife or daughter. In the end, the officials did incorporate these options. This may be a good indicator of how, unlike some other countries, conservative social identities in India remain untouched as they wind through revolutionary projects. The list treated every Indian as equal, but it did not abolish centuries-old inequalities. Getting into the voter’s list may give an untouchable person the experience of standing in line with their employer, but it does not vanquish their caste identity. As Shani says, “Paradoxically, conservative social identities vanished, but (the list) also gave them a new life in another manner." Add to this mix of problems the mother of all migrations, caused by the partition of the subcontinent. It killed a million people and displaced another 18 million. Accommodating the refugees as potential voters posed a threat of communal tensions. So officials were forced to get to the heart of the matter: Who is an Indian citizen? As Shani writes, “People started using the language of the constitution ... (or in other words) the constitution was striking roots, even before it was enacted." It is striking that it took 69 years and a professor from a country at war, Israel, to write this book. When I met Shani, currently a senior lecturer at the University of Haifa in Israel, at the launch of the book in Bengaluru last month, she said most of her research was located in Delhi Election Commission’s archives room, a “dark basement" filled with “spider webs and dust". She also had to structure her work strictly as per “babu hours", the office timings of the administration. The research started in 2010 and by the time she finished the writing, it was 2017. But at no point, she says, she was bored. In fact, she says, there were moments when she was so moved by the archival glimpses into history that she felt goosebumps. For instance, when she found the part in the archives where an official exclaimed, wondering whether India would have enough papers to print the whole list, because, “Hey, all the press is now in Pakistan!" Or when she stumbled upon a Times Of India reader wanting “raw young men" to be kept out of voting. The voting age should be set at 28, he said, when “young men and women are faced with cruel realities of life and are expected to get a little more sober". Another citizen, T. Sreenivasan from Pune, wanted the age to be 25 for men and 20 for women—because “these are considered to be the proper ages for marriage and it may well serve as the age for voting", he wrote to Rajendra Prasad. “After all," he added, “there is not much of a difference between choosing a mate and choosing a legislator." Shani’s book also busts the still-prevalent myth about democracy being handed down to Indians by the British. As she argues, the British were uninterested in creating a universal adult franchise. Even if they wanted to, they would probably not have succeeded. The process was fraught with problems so unique to the land that genuine solutions required a deep understanding of India’s culture and society. For instance, birth certificates or other proofs of birth were absent in millions of Indian homes. But Indian officers found a way out. They sought as proof another document that could be found in most houses—horoscopes. Still, ascertaining the age of voters was one of the biggest hurdles. “How old are you?" was a question many Indians had not encountered in their lives. Some regional officers overcame this impediment by assessing the person’s ability to recall important local or national events: “Were you affected in the floods of 1927?" or “Were you part of the freedom movement of 1930? ", and so on. Using plenty of such anecdotes, Shani’s book makes the point that implementing universal adult franchise in India was much more than a bureaucratic task—it involved carving out a democratic nation, shedding its colonial legacy, and deepening the unity between its Centre and federal states. Shani suggests that democracy was brought to life in India by the process of its implementation and the institutions it created along the way. She says the idealism involved in the making of the first electoral roll was also resilient. Although it was a task so big that it had no precedent or parallel anywhere else in history, it was done “in a responsible, accountable, and, most strikingly, inclusive manner." In short, things were getting done, even if they were thought impossible. Seven decades down the line, where are we on that legacy? To take one indicator, we are still a nation that has not been able to figure out how to amicably share our waters among federal states. The last few decades have seen several states warring over water—Tamil Nadu, Karnataka and Kerala, for instance—making nearly every river in the subcontinent a contested one. Decades of arbitrations have not been able to conclusively settle even one such dispute, despite water wars polarizing states and leading to violent protests every year. Water experts have now started thinking of this as a problem without a solution in sight. Does that give the impression of a delayed, unaccountable and polarized state of affairs? What happened to the nation that was imagined in the list? How India Became Democratic—Citizenship And The Making Of The Universal Franchise: By Ornit Shani, Penguin Random House, 304 pages, Rs599.